In 2016 our extensive work on the Commons continued, with a particular focus on Bodmin and South Wales. The Sanctuary remains full with spaces only coming available as we rehome a horse or sadly one passes on, so we need to find more sustainable ways to help the horses out there that need us. Our Commons work has developed over years and it’s no longer as simple as rounding up large herds and bringing them in to our sanctuary; however from those early days we have gained a great deal of experience working with feral herds, enabling us to handle them safely and to minimise their stress. 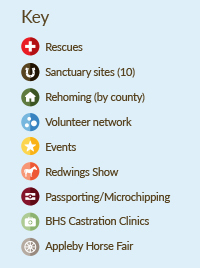 This year’s work was pioneering as we worked to microchip and passport a huge group on an area of Bodmin Moor, assessing their health at the same time, while still, of course, removing those in most need and externally boarding them while we found the best homes. We work in partnership; one of our more unusual outcomes this year was the result of our donation of a horse trailer for the Norfolk Fire Services’ training horse (a model). We continue to support our rescue partners with handling training; as when a horse is loose or in a tight spot it is invariably the emergency services that are called. I must say a heartfelt thank you to the amazing team who work for, volunteer for or support Redwings. It is thanks to you all that we have been able to make 2016 a very productive year, making a real difference to the lives of horses and donkeys in need. In 2016 we rescued horses from South Wales, Essex, Norfolk, Cornwall, Cumbria, Dundee, North Wales – Anglesey, Bristol, and Worcestershire. 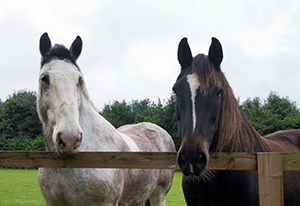 We rehomed horses in East Anglia, Bedfordshire, Hertfordshire and Buckinghamshire. Where possible we try to help horses remain in the care of their owners through providing advice. During 2016, our Welfare and Horse Care Helpline gave advice 1,301 times. The team responded to 280 comprehensive email and written enquiries and investigated 207 concerns (a 13% increase on 2015). The number of calls has reduced from last year but the complexity of call and time spent per call have both increased. Our welfare team is led by a senior veterinary surgeon and is supported by two dedicated welfare veterinary surgeons who attend rescues and cases in order to ensure proper assessment at the earliest opportunity. We have two senior field officers, plus a team of 29 volunteer welfare officers who act as our eyes and ears across the UK. In 2016 we took 144 horses and donkeys into our care. During the year a significant number of our new arrivals were held in external boarding awaiting admission, rather than place further burdens on our horse care and veterinary teams. However, by the end of 2016, the majority had been moved in to the Sanctuary. Only ten of these horses were still being cared for at boarding establishments outside our centres, the last of those from a substantial case a few years ago, where we offered homes to 147 horses (including foals later born to pregnant mares). Did you know? In 2016 we took part in five BHS Castration Clinics and nine Passporting and Microchipping Days, reaching over 200 horses and their owners. 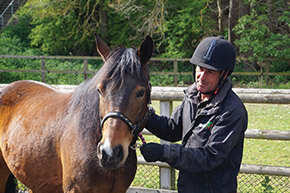 Redwings has a specialist team that focuses on leading on our equine behaviour and training work. The team cascades our approach to horse behaviour throughout the organisation to ensure consistency of handling and a positive experience for our rescued herds. We also take in behaviour case referrals from other organisations. Our work during round-ups is built around our extensive experience in dealing with feral herds. By spending time and applying our knowledge, rescued feral horses are transformed to a point when they no longer have need for sedation for the farrier, for example, and where they can live comfortably and happily within the Sanctuary, or even end up being rehomed. 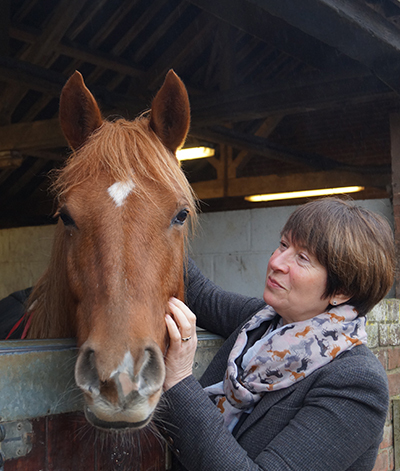 Our specialist behaviour team is keen to share its knowledge and has advised other equine welfare charities, had peer welfare workers spend time observing its work, and runs its own internal training programme. New Redwings staff have equine behaviour training aimed at instilling our approach from day one, as well as ensuring our people are safe in their day-to-day care of our rescued herd. Did you know? As well as our own behaviour team who can deal with any issues within the Sanctuary, we also have an expert horse handler called Mark Hudson who goes out and about around East Anglia to help horses with behavioural problems in private homes. The Redwings Guardianship Scheme allows us to rehome healthier horses at the Sanctuary, creating space for those desperately requiring our help. 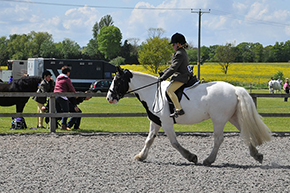 Healthy younger horses that have the potential to enjoy a working life can learn to be ridden at our purpose-built Rehoming Centre in Norfolk or at our Ada Cole Centre in Essex, and then be found a suitable foster home. Those horses that have been retired or require lifelong specialist care (veterinary and/or behavioural) will always remain in our direct care. At 31st December 2016, we had 396 horses in Guardian homes, less than 2015 (421) as many of the horses currently out on loan are elderly and several sadly passed away. Redwings always retains ownership of every horse for the rest of their life so that should a Guardian no longer be able to provide for their horse, or if our regular home checks show that a high standard of care is not being maintained, Redwings can step in and return the horse to the Sanctuary. Our welfare officers performed 437 checks on rehomed horses in 2016, including checks on those horses rehomed by other charities where we were geographically closer. You can also read all about the 2016 Redwings Show! Did you know? 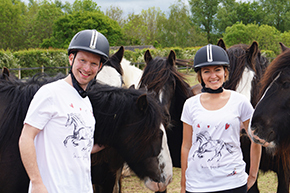 Our rehoming team is supported by Rider Biomechanics Trainer Nicky Donohue who has enjoyed working with us so much she’s now become a fundraiser for Redwings, holding two cheese and wine evenings (yum!) and raising over £350 for us already! Redwings provides permanent sanctuary care to over 1,500 horses, ponies, donkeys and mules who have often suffered neglect or come from difficult circumstances. Many of our permanent residents cannot be rehomed, often because they require lifelong specialist care, but can still enjoy a good quality of life at Redwings. The number of ‘places’ available depends on the needs of both our existing residents and the needs of the potential candidate(s) for admission. As a home to veterans (aged 15 to 19), geriatrics (aged 20 and over), special care cases, and horses in need of specialist handling, life is a constant challenge as it is often not until we admit a horse that we are able to establish their true needs. Redwings has a large older population with 16% veterans and 20% geriatrics. Redwings always strives to maintain the highest possible care standards. We have an Internal Welfare Group dedicated to monitoring our internal care standards and looking at trends in equine care. 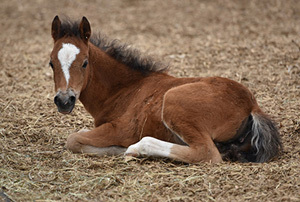 We encourage suggestions from staff on how we can best deliver our day-to-day care and we run Internal Welfare Seminars sharing our horse welfare and care knowledge and veterinary expertise. How we ‘rescued’ the Norfolk Fire and Rescue Service! And meet the hinny who is finally living the life of Riley he deserves! Did you know? A mule is a cross between a donkey and a pony, where mum is a pony and dad is a donkey. A hinny where there’s a donkey mum and pony dad. We currently have 59 donkeys, 14 mules and two hinnies at Redwings. Rather than having to rescue horses and donkeys from abuse, abandonment or neglect, Redwings would prefer people to have the knowledge and commitment to prevent animals from suffering in the first place, or from taking on a horse that they are not able or equipped to care for. 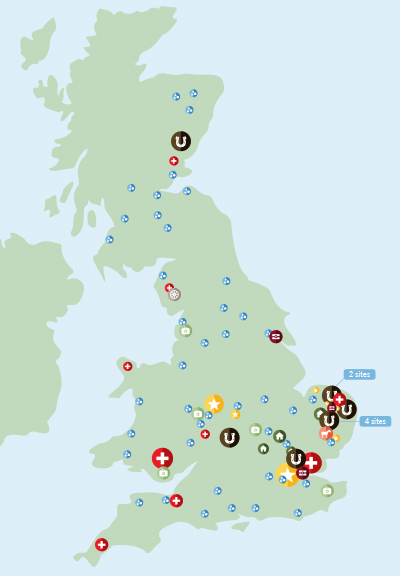 We work with schools, universities and colleges, and local community groups. We also hold seminars for horse owners on veterinary care. 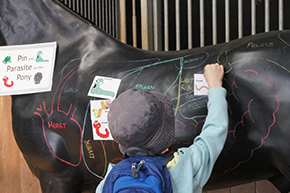 Our website (www.redwings.org.uk) provides free educational resources for teachers and information for horse owners on issues such as equine Cushing’s disease and strangles. We host training days for farriers and equine dentists. In 2016 we started training days on horse behaviour for the RSPCA and the Fire Service. For the second year running, we ran our ‘Best in Show’ campaign at the Appleby travellers’ fair. Download a PDF to discover more about our education work, and new initiatives on Human Behaviour Change for Animal Welfare. Redwings’ campaigns work began when we initiated a coalition of welfare charities to campaign for a new law to protect horses that were being illegally fly-grazed or abandoned. The Control of Horses Acts in Wales and England have been introduced as a direct result and are having a huge impact on vulnerable horses around the UK. We also now campaign on the issue of strangles, following an outbreak at one of our centres in 2015. In 2016, we launched a large-scale strangles survey for horse owners across the UK. 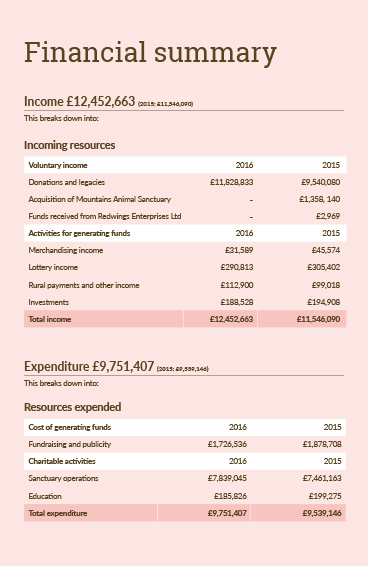 The first half of 2016 was tough, with national media coverage about poor examples of charity fundraising impacting our income. We are grateful to all those who loyally continued to support us – thank you for your trust, faith and help through this difficult time. In 2016, we made the decision to reduce our visitor centre opening from seven days a week to four. By closing three days a week we saved funds on running costs and staff wages, so that more money went towards caring for our horses. Despite the reduced hours visitor numbers fell by just 12% and income by only 6%, showing that our loyal friends and fans still found the time to pay us a visit (and make a donation)! Did you know? In 2016 we asked our supporters to help us do Moor for Horses. Our campaign focussed on reaching horses at risk on moors and commons across the UK, especially those living on Bodmin Moor in Cornwall where we had been working since 2011. Our aim was to reach the most vulnerable, offering health checks, emergency veterinary care, and sanctuary where needed, but most importantly to prevent others from suffering in the first place. Supporters were able to purchase exclusive T-shirts designed by Whistlefish Galleries in Cornwall, and helped by donating much-needed funds to our appeals throughout the year. Create a PDF to find out more about opportunities for volunteering at our visitor centres, changes to how we store and use your data, and a new vehicle making all the difference for staff at our HQ in Norfolk. Our income and expenditure in 2016.